I’m guessing this recipe was originally from Kraft (Cool Whip was supposed to be used), but it’s something that Mom used to make that makes me think of kids – this is probably due to the chocolate pudding. 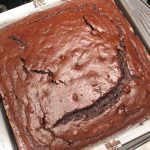 I made a half recipe for the girls for their ‘5 1/2 birthday’, and since it can be served refrigerated or frozen, it was easy to make it the day before. They were definitely delighted. Enjoy! Preheat the oven to 350 and lightly spray a 9 x 13 cake pan. In a medium bowl, use a sturdy spatula to combine together the butter and flour, then add in the nuts and stir well. Press evenly into your prepared pan and bake for about 20 minutes – it should barely start to brown around the edges. Allow it to cool before adding the next layers. Again, using a sturdy spatula and a medium bowl, combine the cream cheese and icing sugar until the mixture is basically smooth. 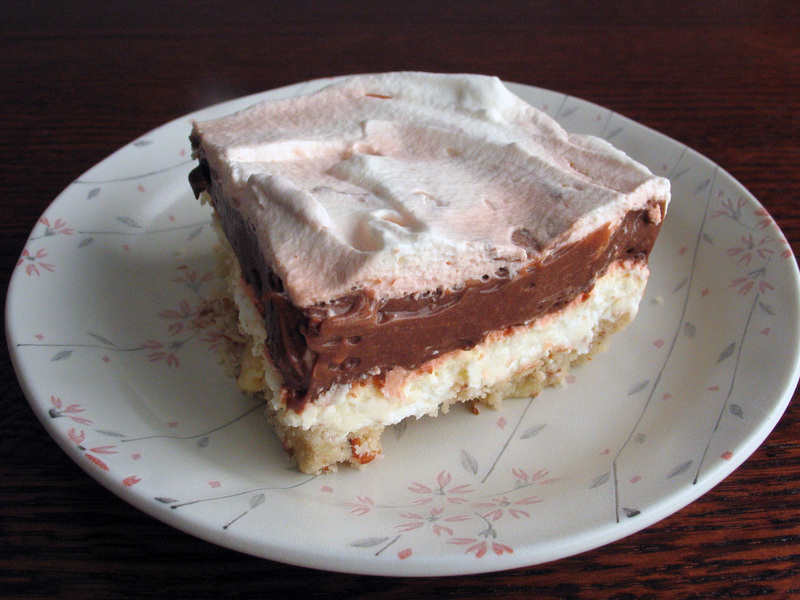 Fold in about half of the whipped cream and then spread it evenly on the cooled crust. In a large bowl, beat together the pudding and milk for 3 minutes – I just used my electric hand mixer here since the whipped cream was in my stand mixer. Spread this evenly on top of the cream cheese layer. Evenly spread the remaining whipped cream across the top and then use a knife to swirl the cream and chocolate pudding layer together. My swirling technique needs work so next time I’ll probably just scatter chocolate shavings over it all – perhaps even mini-chips since children will likely be eating it. Cover and refrigerate it immediately until you wish to serve it, it should be fine to make it a day or more ahead, just remember the cream. Alternatively, there’s no reason you can’t freeze it, just let it sit on the counter for 15 minutes or so before you try to cut into it.